Western Naval Command released notification for 69 post. 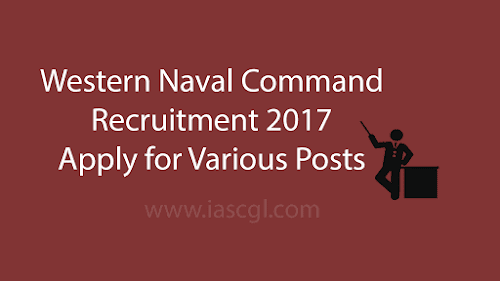 Western Naval Command (WNC) release notification to fill 69 vacancies for various posts. This will be good opportunity for candidate who wants to work under Naval Command. Candidate can details from this article, read throughly. For all MTS posts – Candidate should be 10th passed from a recognized board. Library & Information Assistant – Candidate should have Bachelors degree in Library Science or Library & Information Science. Candidate should also posses minimum 2 years of experience in Library in a Government Organisation. Cameraman – Candidate should be 10th passed along with Diploma or Certificate in Printing Technology. Candidate should also have 5 years of experience in process cameras and 10 years of experience as Cameraman or Photographer in Military Survey. Radiographer (Hospital) – Candidate should have Diploma in Radiography from a recognized university. Along with that Candidate should have two years of experience in Metallurgical Laboratory or experience in operations of Industrial Radiographic equipments. Boxing Instructor – Candidate should be 10th passed with Diploma in Coaching in Boxing Discipline from Sports authority in India or National Institute of Sports. Burgler Instructor – Candidate should be 10th passes with knowledge of music from staff notation and 4 years of experience as Burgler Comet or Trumpet Player in Army, Navy or Air Force. Photo Printer – Candidate should be 10th passed with 2 years of experience in operating and Developing use of photo chemicals and plate making allied duties. Cinema Projectionist Grade -II – Candidate should be 10th passed with license prescribed by respective State Government and 2 years of experience in respective field. Civilian Motor Driver (Ordinary Grade) – Candidate should be 10th passed and posses driving license for Heavy Vehicles along with 1 years of experience – Candidate should be 10th passed and posses driving license for Heavy Vehicles along with 2 years of experience in respective field. Despatch Rider – Candidate should be 10th passed and posses driving license for Heavy Vehicles along with 2 years of practical experience in Heavy Motor Vehicle driving.